If your foundation suffers from cracks, settling, bowed or leaning walls, Foundation Supportworks of the Tri States has the solution for you. After your Iowa, Illinois, or Missouri home is built, changes in the soil around it can damage the foundation. Increase the value of your property and breathe new life into your house. Call us or contact us online today for your free foundation repair inspection and quote in Peoria, or the surrounding areas in Iowa, Illinois, and Missouri such as Quincy, Pekin, Galesburg, Burlington, Ottumwa, East Peoria, Hannibal, Macomb, Canton. When a house is first constructed, the builders dig a hole in dense virgin soil for the foundation. After the foundation is built, the loose soil that was dug out is backfilled around the foundation. This loose soil can easily allow water to pass through and seep into your basement. Through the years, this soil can also expand and put added pressure on your foundation, causing cracks. Foundation Supportworks of the Tri States has a number of solutions for all of your foundation repair issues in IA, IL, and MO. They are compatible with most home designs and can be installed with no damage to gardens, steps, porches, walkways, or other landscaping. Foundation Supportworks of the Tri States uses the Supportworks push pier system to transfer the weight of your home through the piers from unstable soil to competent soil or bedrock. Installation of galvanized steel foundation push piers can be done quickly all year round without the use of heavy equipment. For lighter structures, porches, patios, and other structures that are sagging and showing fatigue, Foundation Supportworks of the Tri States installs the Supportworks line of Helical Pier Systems. Helical piers are mechanically screwed into the soil to assure permanent stabilization. They can be used as an alternative to the push pier system in some situations, and are commonly used in new construction. Helical piers are usually installed with small construction equipment, but can be installed with hand equipment in tight spaces. The shaft has a high resistance to bending and the helical piers offer reduced mess and excavation in and around the home. 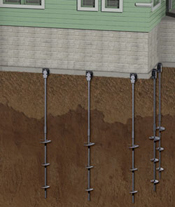 More information about helical piers systems for foundations. Foundation soil shifts and settles when alternating between drying out and shrinking, and swelling from moisture. 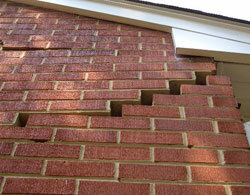 This can result in sinking columns and sagging crawl space beams, which can cause your crawl space to settle. Improperly-spaced beams can also become overloaded and start to sag, causing the floor boards to sag as well. Our SmartJack® Crawl Space Stabilizer has rugged steel support beams specifically designed to stabilize your crawl space and protect your home. 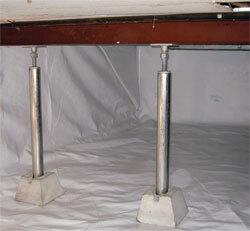 They can support a vertical load of more than 60,000 pounds, and are able to level existing beams and floor joints. 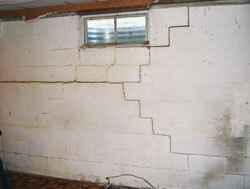 Cracking and bowing in the foundation walls of a house in Burlington, Quincy, and Kahoka of Iowa, Illinois, and Missouri and the surrounding areas is a common problem. It most often occurs as the lateral pressure from the soil around the foundation exceeds the home's load-bearing capacity. 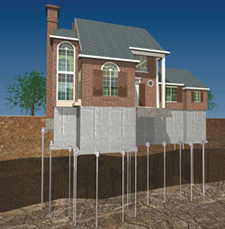 A properly installed foundation wall anchoring system can restore and reinforce the structural integrity of a structure. It will provide a good alternative to removing and rebuilding foundation walls or using other wall bracing systems, and can be installed with minimal landscaping disruption. No matter what your foundation problem is, Foundation Supportworks of the Tri States can find the perfect solution for you! Let us help you by calling us or contacting us online today for your free foundation inspection and estimate in Peoria, or the surrounding areas in Iowa, Illinois, and Missouri such as Quincy, Pekin, Galesburg, Burlington, Ottumwa, East Peoria, Hannibal, Macomb, Canton, Oskaloosa, Fort Madison, Keokuk, Fairfield, Mount Pleasant, Monmouth, Washington.